_Do you have to be Jewish to attend Glasser Preschool? Does your child have to be potty trained to attend Glasser Preschool? No. Children do not have to be potty trained to attend Glasser Preschool. When the child is ready, the teachers will work with the parents to help make potty training a success. What does it mean to have a play-based curriculum? 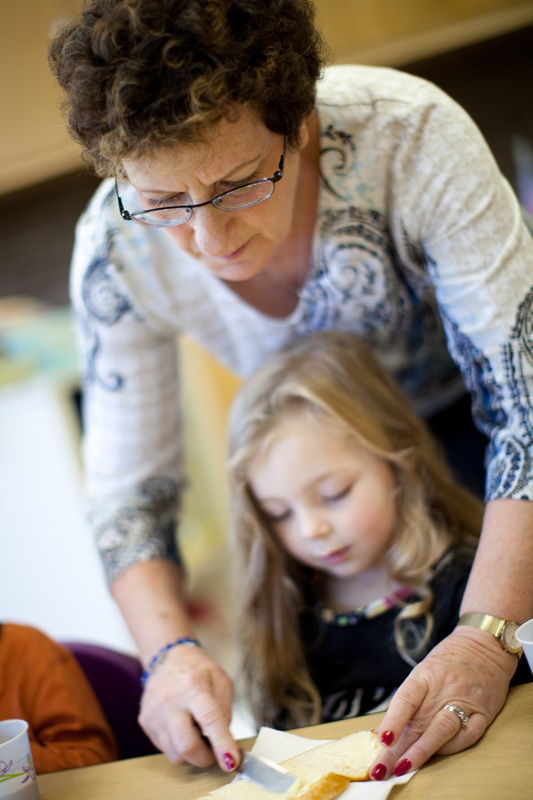 Our curriculum at Glasser Preschool is designed around the concept that children learn through play. Our classroom environment encourages children to make choices, develop a positive self-concept, and promote learning through experimentation and problem solving.Through play our children acquire skills in the five main developmental areas: Social and Emotional; Gross Motor; Fine Motor; Language & Communication; and Cognitive. Your child will learn the skills at Glasser Preschool that will allow them to succeed once they begin formal schooling. Can I come see the program before I sign up? Yes. We welcome and encourage you to attend our Open House on Monday evening January 30th for prospective families. Additionally, you may contact the Director to schedule an appointment to visit the school during the hours when school is in session. Is Glasser Preschool NAEYC accredited? Yes. In May 2010 Glasser Preschool earned re-accreditation from the National Association for the Education of Young Children (NAEYC) – the nation’s leading organization of early childhood professionals. To earn NAEYC Accreditation, Glasser Preschool went through an extensive Self-Study process, measuring the program and its services against the 10 NAEYC Early Childhood Program Standards and more than 400 related Accreditation Criteria. The program received NAEYC re-Accreditation after a site visit by NAEYC Assessors to ensure that the program meets each of the ten program standards. NAEYC-accredited programs are also subject to unannounced visits during their accreditation, which lasts for five years. Glasser Preschool maintains small class sizes. Two co-teachers staff each classroom. The student to teacher ratio varies by age group. The maximum class size at Glasser Preschool is for: two year olds 1:4; three year olds 1:7; four year olds 1:8. Based on the needs of the children in any particular year the class size may often be decreased to help promote the optimal learning environment for the children. Do you have any full day classes? No. Glasser Preschool is a part time program. The regular classes meet for 2 ½ hours. Children may add on lunch or enrichment activities, which will extend the day for a few hours. Is there a fundraising/volunteer requirement for families? Yes. Parent involvement is very important at Glasser Preschool. We want parents to be part of our preschool family. There is a mandatory volunteer requirement of each family for two activities during the school year. The time commitment for these volunteer opportunities varies greatly so that families can participate in a way that works with their family schedule. Families are encouraged to participate in various social and fundraising opportunities during the year. The only mandatory fundraising through is our gift card program. This program does not cost you any extra money. You simply make a monthly commitment to purchase gift cards from Glasser Preschool to use at many different stores. Families can choose to opt out of the gift card program by making a donation to Glasser Preschool at a level set by the Preschool Board. Do you have camp in the summer? Yes. Glasser Preschool offers a program in June and July called “Camp Bet Yeladim.” Registration for our summer program occurs in March. Children are welcome to attend Camp Bet Yeladim even if they have not attended our program during the school year. What is the enrollment procedure? A deposit of one month’s tuition and first semester supply fee must accompany your registration form. Non-temple member fees are also due and payable at the time of registration. The bank’s returned check fee will be charged for returned checks. For yearlong classes, the tuition deposit will be credited to May tuition; for Tots classes the tuition deposit will be credited towards that semester’s tuition. By this application you are making a commitment to pay tuition for a full year. I do not belong to Oak Park Temple - are there extra fees? There is an annual fee for non-member preschool families. This fee will be applied to the child’s tuition if the family joins Oak Park Temple by September 1 st of the school year. How are children placed in classes? The Director reserves the right to make the final decision regarding class placement. Efforts will be made to honor the parent’s first class choice. You may add your child’s name to a waiting list. The Glasser Preschool reserves the right to cancel a class or to consolidate programs due to insufficient enrollment. A full refund will be issued if a suitable alternative is not found for those children. What is the Cancellation of Enrollment policy? Cancellation by August 1 st will result in a refund of one month’s tuition deposit and the non-temple fee. The supply fee is non-refundable. After August 1 st, the one month’s deposit will not be refunded unless the position is filled by a child on our waiting list. If a child begins a program and then is removed, the parents will be responsible for that month’s tuition. The one month’s deposit will be returned if the position is filled by another child. Are scholarships available? Scholarship money may be available for tuition. Scholarship applications may be obtained from the director. What school calendar do you follow? Our preschool follows the Oak Park District 97 Public School calendar for secular holidays and vacation breaks; and the Oak Park Temple calendar for the Jewish holidays. Questions? If you have any questions, please call the director at 708.386.3937, extension 15.